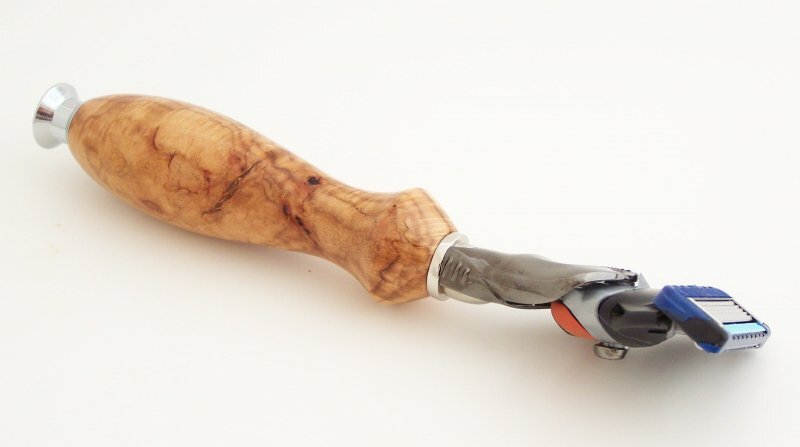 This Cherry Burl wood Fusion FlexBall shaving handle was handturned in my shop. FlexBall is the newest product in shaving technology, so if you want the latest and greatest then the FlexBall is what you are looking for. The Fusion FlexBall shaving head swivels left and right over your facial contours so you never miss a spot. The handle with Fusion blade attached is 6 1/4" long. The handle pictured is the one you will receive. The shaving razor's finish (Cyanoacrylate--i.e., Superglue) is durable, highly polished and cannot be penetrated by water. 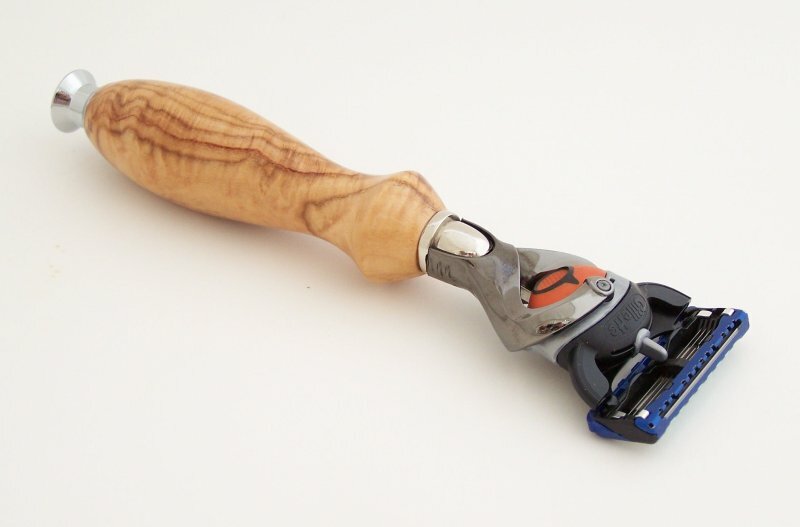 When using the razor, you can get the handle as wet as you want during use and not worry about the wood being damaged. To maintain the finish you just need to wipe it dry after each use. Don't buy a handmade razor unless you know exactly what is used for the finish. I make hundreds of custom razors each year and this is the only finish that will last for years in the tough shaving environment. The handle on this Fusion razor is solid wood. Many of the Fusions sold on-line are craft kits that use a hollow brass tube for the mass of the handle with only a thin layer of material covering the hollow tube. These kit Fusions are easy to spot because the head mechanism is clearly not an original Gillette product. Before buying a handmade Fusion razor, make sure you know what you are buying. 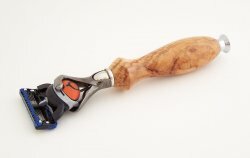 My Fusion shaving razors are made one at a time by me at a pace that allows for the crafting of a unique and beautiful addition to your home or collection. These items make great gifts for those hard to get men and women in your life.